Life moves fast and we all need to learn to slow down sometimes. Lindsay and Alana are mountain bikers during the summer months and enjoy exploring the forest in the winter on their fatbikes. Of course, I can relate, spending as much time as I can out on the trail all year long. Mountain bikes are fast, but fat bikes are innately slower due to snowy trail conditions and of course big, fat tires. We ride the same trails in the winter but notice different things. During the shoot, we talked a lot about how fatbiking slows you down and you appreciate and notice things in the forest that you don’t see on those ripping fast summer days on hard packed dirt. There’s so much beauty that we obliviously barrel past in the summer that becomes beautifully obvious in the winter. We slow down by necessity but that very necessity gives us a treat. Views of babbling streams, deer hoof prints in the snow, owls in the trees and vistas along the trails edge. So good! Right, so back to the engagement shoot! We rode our bikes around the trails and stopped when the scenery jumped out at us and made some photos together. Then, we wrapped up the shoot with a pretty epic sunset. We were done shooting well before the sunset, so we just hung out in the field and chatted. We watched the sun dropping towards the horizon until I knew it was time to shoot a few silhouettes. Again, the theme of slowing down and enjoying the environment and the people around you. I feel so blessed to have a place like the Mountain Bike Kingston trails to enjoy life’s “little things” and clients who share the same passion. Will this force us to slow down come summer when we’re back on our fast bikes? Probably not, but damn, I’m so happy about enjoying it all winter long. 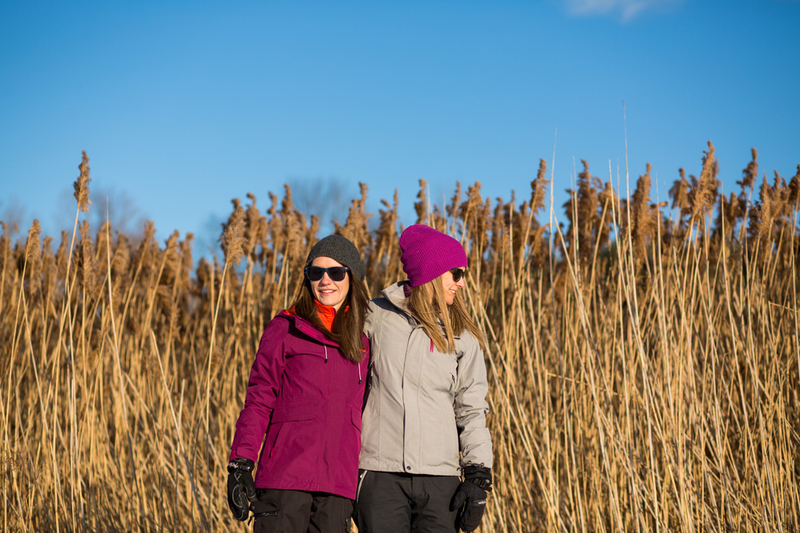 And, I’m so happy I got to share the slow pace of a fatbike ride with Lindsay and Alana for their engagement session. Beautiful shots! So happy for these two! Great pictures and natural models!! Awesome pics ladies…you both look so happy! So heart warming to see how your journey has unfolded. Wishing you years of happiness.